Donnell sailed from Boston 31 August 1943 for trans-atlantic convoy duty. She guarded the safe passage of four convoys to Londonderry and return in the buildup for the invasion of Europe in June. At sea bound for Londonderry again on her fifth voyage, on 3 May 1944, 450 miles southwest of Cape Clear, Ireland, Donnell made a sound contact, then sighted a periscope a few minutes later and pressed home a depth charge attack. Simultaneously, she was struck by a torpedo from U-473* (formerly credited to U-765) which blew off her stern. Explosion of her own depth charges inflicted additional damage. 29 crewmembers were killed. 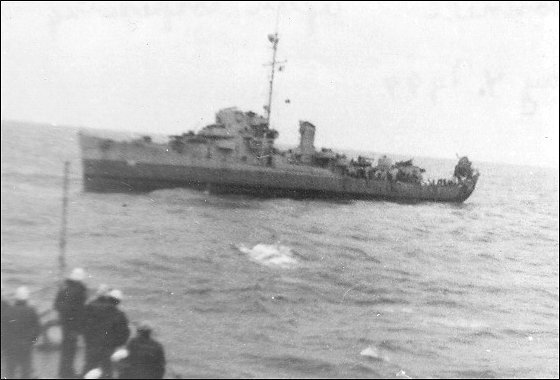 Donnell was towed by USS Reeves DE 156, USS Hopping DE 155 and HMS Samsonia to Dunnstaffnage Bay, Scotland, arriving 12 May. Since repairs would have involved extensive reconstruction, she was placed in commission in reserve at Lisahally, Northern Ireland, 20 June 1944, for use as an accommodation ship. She was reclassified IX-182, 15 July 1944. Towed to Plymouth, England in July to embark passengers and take on cargo, Donnell was towed in August to Cherbourg, France where she supplied electric power to shore installations. In February 1945 she was returned to England and served as barracks ship at Portland and Plymouth until towed back to the States, arriving at Philadelphia Navy Yard 18 July 1945. She was decommissioned 23 October 1945 and sold 29 April 1946. Photo courtesy of Alison Strehlow and Navsource Web Site.